The Purple Line is a proposed light rail transit project that would thread itself through suburban neighborhoods over 16 miles in an arc from the east of Washington, DC, to its north. It is a controversial project, but with strong political pressure to sign soon a contract with a private concessionaire who would construct and then operate the rail line over a 30 year life. The aim is to begin construction in 2015, complete construction by late 2020, and open the line to ridership by early 2021. The project is controversial for several reasons. There are environmental and noise concerns, as a portion of the line will be routed over what is now a park (on an old, abandoned, rail line) with a walking and biking trail that is the most popular in Maryland in terms of usage. Two parallel rail lines would be built on this trail, with a new trail then built alongside the tracks, necessitating the clear cutting of the mature trees along the trail to allow for the much wider right of way. There will also be major noise issues, as frequent trains (every 10 minutes in each direction during the off-peak hours, and every 6 minutes during the peak) will go by, until 3:00 am on weekends and starting at 5:00 am on week-day mornings. Homes now backing on to a quiet park will instead have to contend with the noise of the frequent passing trains. No compensation will be provided to those adversely impacted, and it should not be surprising that they, as well as others, are opposed. The line is also expensive. The most recent estimate, from July 2014, puts the capital cost alone at $2.4 billion, with annual operating costs then of $58 million. But the Purple Line will only serve suburban neighborhoods of medium to low density, so ridership will not be high. The cost estimates are of course only estimates, and the final costs will not be known until the work is completed (when it is too late to do anything). Based on past experience with such projects, one should expect that the final costs will be substantially higher than these estimates. And as will be discussed below, the published cost estimates do not even cover all of the costs that will be incurred for the Purple Line. Finally, even these estimates have increased substantially from what they were initially. As late at June 2007, with initial design work well under way and alternatives being considered, the estimated capital cost was only $1 billion. Subsequent estimates were $1.5 billion (in August 2009), $1.9 billion (in September 2011), and $2.2 billion (in September 2012). The most recent estimate is $2.4 billion. Few will be surprised if this goes higher, and perhaps much higher. These cost totals by themselves do not tell us much, however, unless they are put in the context of how many riders will use the system. While thousands of pages of documents have been posted on the web on the proposed project, with the Final Environmental Impact Statement (FEIS, August 2013) the most comprehensive review, I have not been able to find any serious economic analysis of the project, nor of the alternatives to provide such transit services. The FEIS does describe in great detail a set of alternatives it states they considered, and I am sure such work was done. There are full chapters in the FEIS on the alternatives (see in particular Chapter 2 and Chapter 9). But figures are not presented which would allow one to compare one alternative to another. Evaluating major projects such as this is something I did during my career at the World Bank. This blog post will summarize estimates I have made of what the full costs of the Purple Line will be, and will compare these to some alternatives. A transit project such as the Purple Line will incur both upfront capital costs to build the system, and then annual operations and maintenance (O&M) costs to operate it. Ridership will start only once the system is built, and then should grow over time. Determining the full cost of the system per boarding (one rider getting on board for one trip) is therefore complex. While it would be easy to determine the annual O&M costs per boarding once the system is up and running, one should not ignore the up-front capital costs that are incurred. And since the capital costs are incurred up-front, there will be interest costs, either explicit (for what the private operator borrows) or implicit (if government grants are used – but such funds will still need either to be borrowed or to come from some other use, so there will be an opportunity cost in such usage of the limited funds available). One cannot simply ignore the costs of these funds, and yet the published analysis appears to do just that. One therefore needs to use a spreadsheet which separates out by year when the costs are incurred (both capital and O&M costs), and when the ridership occurs. One can then calculate what the cost would be per boarding which, over some given lifetime, would cover the full costs incurred by building and then operating the Purple Line. If riders are charged this cost per boarding (and assuming the projected ridership would still be the same, even though such a fare was charged), the system would cover its costs from the ridership. While transit systems rarely cover their full costs from the fare box, one will still need to know what this cost will be to judge whether the system is worthwhile, as well as to judge whether some alternative would be a better use of the funds. The Technical Note at the bottom of this post describes in some detail the methodology followed, the sources for the data used, and the assumptions then made. The end result is that the estimated full cost for the Purple Line comes out to be $10.42 per boarding, in terms of constant dollars of 2012. This is a lot. The riders on the Purple Line will mostly be making only short trips of just a few miles, connecting to Metrorail lines and/or traditional bus routes to get to and from work. At $10.42, private taxi service would likely normally to be cheaper. The busiest portion of the route is expected to be between Silver Spring and Bethesda, connecting two business centers each on two effectively separate Metrorail lines (although in fact they are the same line, after looping through downtown Washington, DC). This is the portion of the route that would destroy the existing park. It is only 4.3 miles long, and the time savings would be small. Existing local bus service between these two points only requires 17 minutes, and that is during rush hour. The Purple Line light rail service would require 9 minutes, producing a savings of only 8 minutes. It is expected that few if any travelers would ride the full 16 miles of the line. Traveling that route on the Purple Line would take an estimated 63 minutes based on the current design. But one could travel between the same two points on the existing Metrorail service in 51 minutes now, during rush hour. The Purple Line is designed for local service. Riders would of course not pay that $10.42. If they were charged such fares for the short trips being taken, very few would take the Purple Line (as noted, taxis would likely be cheaper). The FEIS (Chapter 3, page 3-8) estimates that the additional fare box revenue in 2040 (but in 2012 dollars) would be $9,615,564 (which is more precise than one would think they intend). Based on the FEIS ridership projections, this comes to just 38 cents per boarding. It is so low because most of the riders would be transfers to and from Metrorail and traditional bus services, or would displace ridership on existing services. Transfers pay zero or small additional fares. The cost per boarding of $10.42 and the fare per boarding of $0.38 implies that the subsidy that would be provided to those riding the Purple Line would be $10.04 per boarding. These figures are shown in the chart at the top of this post. A subsidy of over $10 per ride is huge. To put the $10.42 per boarding cost of the Purple Line in perspective, one needs to look at alternative forms of transit. Montgomery County, Maryland (through which roughly half of the Purple Line will run) is also looking closely at use of Bus Rapid Transit (BRT) systems for certain of its public transit routes. A consultant’s report completed in 2011 commissioned by the county provides figures that can be used to provide perspective on the Purple Line costs. A Bus Rapid Transit system provides high-capacity and streamlined bus services along selected routes. By use of larger buses, dedicated stations where one will pay the fares before boarding (thus streamlining boarding), various road improvements and perhaps dedicated bus lanes, one can provide transit services that are significantly faster than, and more comfortable than, traditional bus services. The Montgomery County BRT system would cover 16 routes, versus only one for the Purple Line. It would cover 150 miles, versus only 16 for the Purple Line. The projected daily boardings in 2040 of 186,300 (based on the mid-point of the range projected) would be over three times the 59,130 projected for the Purple Line. And the operational and maintenance (O&M) costs per boarding (again based on the mid-point of the range in the BRT study) would be 10% less. Normally one justifies the higher capital expenditures per mile of a rail system by its then lower O&M costs. But the O&M costs of the Purple Line would be higher. The full cost (including capital costs) per boarding of the BRT system is then far below the cost of the Purple Line. 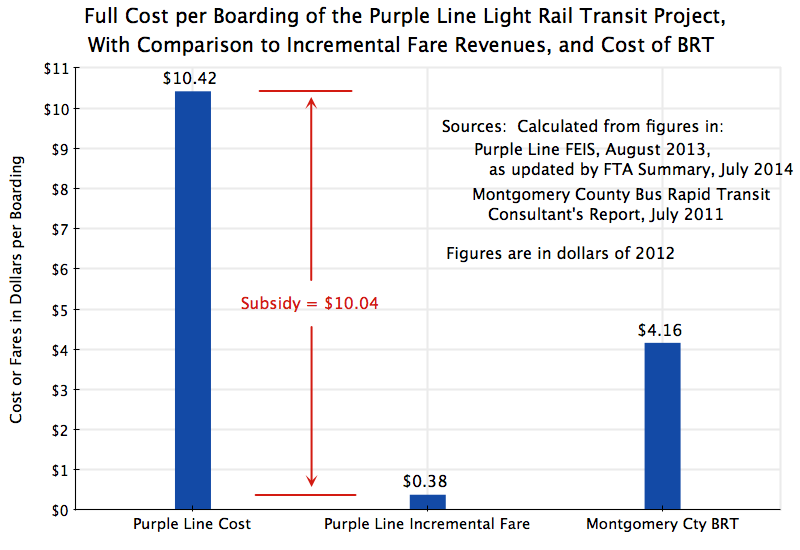 As discussed above, the estimated full cost of the Purple Line would be $10.42 (in 2012 dollars). Using a similar methodology, but with the BRT cost and ridership estimates, the full cost of the BRT system would be $4.16 per boarding, or 60% less. The BRT system would be a far better investment, then, of the scarce transit dollars available. Many more people would be served, at a far lower cost. For the Purple Line corridor itself, various BRT systems (as well as alternative light rail systems and other options) were examined by the Purple Line consultants, but rejected in favor of the light rail system selected. However, I cannot find in any of the thousands of pages of documentation now posted any presentation of figures on the total cost per boarding of a light rail system versus a BRT for the selected route. It is not clear if this was ever examined. And some have argued that the BRT alternative was never seriously considered as an option, but rather that the light rail approach was chosen early, with the analysis then done by the hired consultants directed at justifying this choice. It is possible that the BRT alternative was rejected for the Purple Line corridor due to the nature of the streets it would pass through, in particular on the Prince George’s County portion of it. However, a BRT would likely work quite well for the section between Silver Spring and Bethesda, where there is a four-lane major road connecting the two centers. A BRT could simply run along that. A BRT would also provide an option to loop up to another major employment center just north of Bethesda, where the Naval Medical Center and headquarters (and main labs) of the National Institutes of Health are located. The proposed light rail system would not do that. Use of a BRT line between Silver Spring and Bethesda would also mean that the linear park between the two would not be destroyed. A hybrid system of light rail up to Silver Spring, and then BRT between Silver Spring and Bethesda, would be a possible compromise. The BRT could then join up with north-south BRT lines being planned separately for Bethesda, as well as BRT lines being planned for Silver Spring. As noted above, the subsidy of over $10.00 per boarding for the Purple Line is huge. The cost will be borne in one form or another (either capital subsidies or operational payments) by the government, and hence ultimately by the taxpayer. Recognizing that government would be providing a subsidy of $10.00 per boarding to transit users in this corridor, provides a new and better perspective on how best to provide transit services. Instead of asking the question of how much will it cost to build and then operate a light rail transit line, the question shifts to how best to use the funds that would be made available for transit in this corridor. When one looks at the issue this way, one alternative stands out: Why not simply charge a zero fare for bus service along the Purple Line corridor (and perhaps more broadly)? While I was not able to find figures to allow a calculation of the full cost of operating a traditional bus system in an area of similar density as the Purple Line corridor, the cost should be expected to be less than the cost of a BRT system in Montgomery County. That is, the cost will likely be less than $4.16 per boarding. And note that with no fare being collected, there will be at least two additional advantages gained over current bus service. First, the new bus system will have a similar advantage in terms of speed as a BRT system. BRT buses are able to move more quickly on regular roads primarily because they can load passengers quickly, since fares have already been paid at the special bus stations built at each stop along a BRT line. But if no fares are being collected, one can simply get on a traditional bus quickly, with no delays due to people lining up to pay their fare. Over time, one could also replace current buses with ones with multiple entrances and exits, since everyone would not need anymore to pass through the front door by the driver, to ensure fares were being paid. This would allow even speedier boarding. Second, collecting individual fares is costly in itself. Cash fares need to be kept secure and later counted and deposited, and one needs special equipment and technology to keep track of fares paid by those using electronic smart cards or similar devices. In addition, speedier bus trips mean that the number of driver-hours one needs to pay for (the most significant expense in operating a bus system) will be reduced in per rider terms. Both of these factors reduce costs, and significantly so. But even assuming the traditional bus system will have full costs of $4.16 per boarding (the same as the BRT), one could still carry 2.4 times as many passengers as the Purple Line would carry, for the same net cost (of $10.04). With a likely cost of well less than $4.16 per boarding, one could carry even more. And with a larger number of riders, a higher frequency of bus service on each route (say every five minutes instead of every 15 minutes) could then be supported. Free fares for riders coupled with more frequent service would then be expected to attract even more riders, and possibly many more. The main concern public officials should probably have is that such bus service would become so popular that many more than 2.4 times as many riders would want to ride the system. While economies of scale (more riders on each bus, on average) will reduce costs per rider to even less, a large number of new riders eager to take buses is a “problem” that public officials should welcome. One would then also expect that such ridership shifts to public transit would start to have a significant impact on car usage and hence road congestion, even with additional bus service. An individual bus with reasonable ridership levels displaces many cars from the roads along the corridor. Even if it were argued that such a shift to free and frequent bus service were not possible for much of the Purple Line, it is clear that it would work well for at least the Bethesda to Silver Spring section. As noted above, there is an existing four lane road, and even during congested rush hour traffic, the current traditional bus line (with its frequent stops, and passengers lining up at each stop to step aboard and pay their fare) only requires 17 minutes. This could be sped up significantly with a shuttle service where no fare is paid (so need to line up to pay it) and perhaps a limited number of stops. Such a service would likely match or almost match the 9 minutes the Purple Line light rail system would require for this 4.3 mile segment. Furthermore, one could start to offer this free shuttle service immediately. There is no need to wait until 2021 for the Purple Line to be built. This alternative would also save the park that the Purple Line would destroy, and the residents whose land now backs on to this park would not need to contend with the noise of rail cars passing their windows every 5 minutes until midnight (as a train will pass every 10 minutes in each direction), and until 3:00 am on weekends. a) Bureaucratic rules: Government support for transit projects is biased to providing capital support to build things, rather than operational support to run things. State and especially federal government support is biased in this way. This creates distortions when decisions are made, as an option requiring much up-front capital will be favored over a solution which instead has primarily on-going operational expenses. Funds for the capital investment may be available as a grant, while operational expenses are not covered (or are not covered to the same degree). There would likely be such an issue here, as the state and federal funding is focussed on providing grants for construction. Those advocating the expensive light rail system will argue that while they can get these funds for construction, they could not obtain such funds to operate improved bus services along this corridor. But these are bureaucratic rules. Such rules can be changed. If a cheaper option than a light rail system (such as free and frequent bus service) provides a better solution, then elected politicians should be able to find a way to make this possible. b) Some parties will gain by an expensive light rail system: Even though transit users as well as taxpayers might lose by building the expensive option, there are some groups that may gain. Two in particular should be noted. One is developers who own land parcels close to the proposed stations of the Purple Line. These parcels will gain significantly in value as transit users are channeled to those locations (and not to others), with land values that may well rise by hundreds of millions of dollars. Someone else will be paying the $2.4 billion construction cost. The second is the group of private construction and engineering companies that will participate in the construction, as well as the ultimate concessionaire. Profits on a $2.4 billion project are substantial. c) The embarrassment factor from admitting your choice was wrong: Finally, one should not neglect that politicians and others will be extremely reluctant to admit that they made a mistake on a project they had previously supported and indeed championed. But they should not be criticized if they recognize that the information they had before was perhaps insufficient, or that conditions have changed as more information has been gathered. The Governor of Maryland announced in August 2009 that a light rail line would be the “locally preferred alternative” for the corridor the Purple Line would serve. At that time, the capital cost was estimated to total just $1.5 billion, with construction that could start in 2013 and be competed by 2016, and with projected daily boardings of 64,800 by 2030. But the current estimates are that the capital cost will come to $2.4 billion (60% more), construction will not begin until 2015 and only be completed in 2020 (four years later), and that daily boardings now projected for 2030 are only 53,000 (18% less). Estimates are of course only estimates, and one cannot know for certain beforehand what the costs and ridership will be, nor how long it will take to build such a system. But how high do the costs need to go before one agrees that earlier decisions need to be reconsidered? A 60% increase is not small. One way to resolve this: Why not hold a vote? Arrange for a ballot referendum in the areas impacted, where the population would be allowed to vote on whether they prefer the Purple Line light rail system (to be built as currently proposed, and with regular fares then to be paid to ride it), or the alternative of using the funds to provide free bus service along this corridor, starting immediately. Since the issue is one of service preferences, as the costs would be similar, the general population should be given a say in how the funds are utilized. This technical note presents in some detail the methodology, sources of data, and assumptions made, to come up with an estimate of the full cost per boarding of the proposed Purple Line Light Rail transit project. The basic approach is to develop a spreadsheet which estimates the full costs (for each year over the lifetime of the project) of building and then operating the rail line. One then subtracts from these costs what would need to be “charged” per boarding, so that the “revenues” thus generated (given the ridership estimates) will suffice so that the project will have paid for itself in full by the end of the time horizon chosen. The “shadow fare” thus computed is not the fare that would actually be charged, but rather the cost per boarding that would need to be covered for the full cost of the project to be covered by the end of the time horizon. Riders are not in fact charged this fare, but rather something far less. The purpose of the exercise is to calculate what the full cost per boarding will be. The spreadsheet needs to break out the costs by year since, like any project, capital costs are incurred up-front, ridership starts only when the project is completed, and ridership generally will grow over time as the region grows and develops. Annual operations and maintenance budgets will also grow over time to cover the costs incurred from carrying more riders (with more frequent train service, for example). Importantly, because major capital expenses are incurred up front, there will be a cost from providing the necessary funds up front, to be repaid only later. These will be interest costs. These interest costs will be incurred whether the project itself borrows directly the funds necessary for the construction, or if some level of government (federal, state, or local) provides the funds as a grant. The grant funds need to come from somewhere, and governments need to borrow. Even if the governments were currently running a budget surplus, they could have used the funds being provided to the transit project instead to pay down some of the government’s existing outstanding debt, or for some other use. Economists call this the opportunity cost of capital, and it exists even when the transit project itself is receiving the funds as a grant. This cost cannot be ignored, even though it often is. Thus the basic structure of the spreadsheet starts by accounting for the capital costs during the construction period, by year, and including the interest costs incurred (implicit or explicit) to cover those capital costs (and after the first period, also the costs of covering the accumulated interest itself). The construction period is primarily 2015 to 2020 according to the current planned schedule. Operation then begins in early 2021, with annual operations and maintenance costs starting then and ridership beginning. Since the current plan is to provide a concession to a private firm to build and operate the system, with the operations concession lasting for 30 years from the end of the construction period, the spreadsheet was used to determine what “shadow fare” would be necessary so that at the end of this 30 year concession, the “revenues” thus generated (given the ridership projections) less the annual operations and maintenance expenditures, would have covered the up-front capital costs incurred (along with accrued interest on the outstanding annual balances). An iterative process was used to arrive at that shadow fare. That shadow fare will be the full cost incurred, per boarding, of this light rail line. The calculations were done all in current dollar terms. That is, certain inflation rates were assumed and the implicit interest rate on the capital costs was defined in nominal terms. However, all the figures reported here on cost per boarding are expressed in terms of prices of 2012. One could have set up the spreadsheet to do all the calculations in real, inflation-adjusted, terms, but the results (if everything was done correctly) would be the same. For the purposes here, working in current price (or nominal) terms, was simpler. Data were taken from the documents posted on the internet for this project. Most important were the most recently updated summary sheet from the US Federal Transportation Agency (FTA) of July 2014; the Final Environmental Impact Statement (FEIS) of August 2013, in particular its Chapters Two, Three, and Nine, plus its Volume III Technical Report on Capital Costs; and the “Request for Proposals (RFP) to Design, Build, Finance, Operate, and Maintain the Purple Line Project”, issued by the State of Maryland in July 2014. One would have expected that with all these reports, totaling thousands of pages, the project designers would have made available a spreadsheet of their own with the expected costs by year as well as ridership. But the information from such a spreadsheet does not appear to have been posted. I am sure they would have themselves made such calculations, but they evidently chose not to make them available to the public. I therefore had to make various estimates of my own, drawing on the figures they did make available and anchoring the projections in the figures they provided for only certain of the outlying years (most commonly 2035 or 2040). Due to the inherent uncertainties in all this, I erred on the side of conservatism whenever assumptions needed to be made. That is, I aimed to err on the side of keeping estimated costs low. The estimated cost per boarding (in 2012 dollars) of $10.42 in the base case is therefore probably low. The true figure will probably be higher. But I have some confidence it will be at least this high. 1) Estimated capital costs (construction costs) was taken from the FTA summary sheet. The figure reported there of $2,427.97 million includes, however, $126.0 million in “finance charges”. These finance charges appear to include the financing costs that will be incurred only on the private borrowing portion of the total costs (estimated to cover $800 million of the overall $2.4 billion cost) and only during the construction period. Since the total financing cost (including on government borrowed funds) will be accounted for separately, the capital cost figure used for construction expenses only was $2,302 million ($2,428 million less $126 million). Like all the cost figures presented in the FEIS and RFP, it is assumed these are expressed in prices of 2012. They were then spread evenly (in real terms) over the construction period of 2015 to 2020. 2) While this capital cost figure of $2,302 million was used, it should be noted that all of the capital costs of the project have not been accounted for in this widely reported figure. In particular, it does not include the cost of perhaps the most complex and difficult light rail station to construct, at the western end of the line (Bethesda). This will be fitted into an existing underground tunnel under a building (where the old train line had run), with underground connections made there to link it to an existing subway line station. Consideration was given to tearing down the existing building above the lines to allow the construction, but a recent decision was made not to, as the costs would be even higher. The capital cost figure also does not include the cost of re-building the existing walking/biking path that the new rail line will take over, as this cost will be covered by Montgomery County. However, it is still a cost, and should have been included. Finally and perhaps most importantly, the capital cost figure of $2,302 million does not include anything for the significant costs incurred (mostly by the State of Maryland) for the design work, environmental impact and other assessments, and all else that has been done to bring the project to this point. As has been noted, thousands of pages of analysis have been posted on the internet, consultants were hired to produce these reports, and public officials have devoted a good deal of time to organizing and overseeing this work. These costs should not be ignored. While it can be argued that these costs are already incurred and hence should not be a factor in what to do now, one should then not present the capital cost estimate (of $2,302 million currently) as the total capital cost of the project. Rather, it is an estimate of the additional capital cost now needed to complete the project. But in any case, since I do not have figures on the costs already incurred, I have had to leave them out. The true total capital costs are higher. 3) Also left out is any valuation for the cost of the public lands taken (including public park lands) for the rail line. The public park and other public lands taken have been treated as if they were free, with zero value. In particular, the western section of the line, from Silver Spring to Bethesda, will be built over an existing walking/biking path, and will need to clear-cut the existing trees on both sides to allow for the two new parallel rail lines plus a re-built path adjacent to it. The park will be effectively destroyed. Instead of a walk through the woods, one will have a utilitarian paved path next to a busy rail line. If this project were being financed by the World Bank in a developing country, the World Bank would have required (by its environmental standards) that a new similarly sized park be created near-by, as an environmental offset to the land taken for the transit project. The cost of acquiring this new park land would then be reflected in the project cost. The cost would not be small, which is probably why it was never seriously considered here, but that high cost (reflecting the high value of such land) is precisely the point. And while poor countries are expected to follow such measures to protect the environment, there is no such plan here, even though Montgomery County (where this section of the line will run) is one of the richest counties in one of the richest countries in the world. 4) The implicit interest rate used (the opportunity cost of capital) to cover the cost of the up-front capital expenditures will also be important. The project documents appear to have all left this out (except for the relatively minor $126 million finance charge included in the most recent FTA summary sheet, discussed above). The current financing plan is for two-thirds of the cost to be covered by government grants (federal and state) and one-third by private borrowing by the project concessionaire. The private borrower will of course need to cover its interest costs. While interest rates are currently low, and have been since the Lehman Brothers collapse in September 2008 (as the Fed has kept rates low to spur the recovery), it is expected that interest costs will return to normal once full employment is recovered. Over the ten year period leading up to September 2008, the average corporate bond borrowing rate for a AAA borrower averaged 6.2%, while it averaged 7.1% for a BBB borrower over this same period. To be conservative, I assumed the borrowing rate would be 6.0% for this project, even though this is likely to be low. Note that this is a nominal, not real, interest rate. 5) More importantly, one also needs to include a cost for the government funds being provided. It is certainly not zero, even if the project itself receives the funds as a grant. The government has to obtain the funds from somewhere. And while the government can borrow, in this case it is choosing to have the private concessionaire borrow funds for a substantial share of the project, rather than provide additional government borrowed funds. This implies that the government would rather have the private entity borrow funds for the project, and that it views this cost (assumed to be 6.0%) as preferable to whatever it would pay for directly borrowed funds. Therefore, the spreadsheet calculations were done based on a 6.0% interest cost, implicit or explicit, for the full project cost. 6) Finally, all the calculations were undertaken in nominal terms, and hence one needed to make certain inflation assumptions. Based on figures from the RFP and the FEIS, I assumed inflation rates of 3.1% for the construction costs, 2.5% for operations and maintenance costs, and 2.0% for general consumer prices (reflected in the shadow fare rates). 7) Ridership forecasts were taken from the most recent FTA summary sheet, which shows figures for 2014 (which I interpret reflect what ridership would be today, if the system were operational today) and for 2035. It was assumed ridership between these dates would grow at a steady growth rate. This worked out to 1.113% a year, which is reasonable for the already developed region the rail line would go through. Based on these cost and ridership assumptions, the cost per boarding for the proposed Purple Line comes to $10.42. This is a lot, for what is designed to be basically a local service (providing connections to and from Metrorail lines and traditional bus services). The base case assumptions, as noted, lead to an estimated break-even cost per boarding of $10.42. If the borrowing costs (implicit or explicit) were 7.0% rather than 6.0%, then the cost per boarding would rise to $11.62. Some would argue that a 7% borrowing rate over the long term would likely be a better estimate of what it will be for such a project entity in coming decades than 6% (the BBB borrowing rate averaged 7.1% over the decade before Lehman Brothers collapsed), but the Base Case was deliberately conservative. Extending the time horizon would also affect the break-even cost. The private concession is planned to extend for thirty years of operation following completion of construction, so determining the break-even cost per boarding at that point is of interest. But some of the assets would likely last longer. Offsetting this, however, is that there will also be major rehabilitation costs periodically, and I was not able to find any estimates for what those would be. They were therefore implicitly set at zero. But even assuming rehabilitation costs were zero, and that assets were all able to last for 40 years rather than 30, the break-even cost per boarding would still be high at $9.28. Ridership is also difficult to predict with great confidence. Ridership that turns out to be 20% less than projected would raise the break-even cost per boarding to $13.02. Construction costs (capital costs) also often turn out to be higher than projected, and/or completion takes longer than planned, and these often come together (delays in completion lead to higher costs). If the capital cost turns out to be 20% higher, then the break-even cost per boarding rises to $11.92. If completion is delayed by two years (but with no additional capital cost), the cost per boarding would be $11.02. And if both the capital cost turns out to be 20% higher and completion is delayed by two years, the break-even cost per boarding rises to $12.64. Finally, one could have (and indeed generally will have) a combination of differences. Some might be offsetting, but one could also have some combination of lower ridership, higher construction costs, delays in completion, and higher borrowing costs. But the degree of difference in each case might well be less than those tested here. Based on the sensitivities in these scenarios, the estimated cost per boarding of $10.42 in the base case is probably accurate within a dollar or perhaps two. Given past experience with such projects, there is a greater likelihood that costs will turn out to be higher than expected rather than lower. I would therefore doubt that the final cost per boarding turns out to be less than the base scenario estimate of $10.42, while there is a significant risk that it could be $12 or even more. The Washington Post reported (in its print edition today, and in an on-line note yesterday) that the official estimate of the capital cost of the Purple Line has increased again, by $21 million this time from the estimate published in July. The total is now $2.45 billion. While the $21 million increase should perhaps not be considered large in itself, it comes as the most recent such increase that has steadily raised the estimated cost of the Purple Line from just $1 billion in 2007, to the estimated $2.45 billion now. I have not changed any of the text above. With this new capital cost estimate and assuming nothing else has also been changed, the cost per boarding would now work out to $10.48, a bit more than the $10.42 estimated before. This entry was posted in Economics Applied and tagged infrastructure, policy, project analysis, Purple Line by aneconomicsense. Bookmark the permalink.